Mare Tranquillitatis (Sea of Tranquility) is a progressively written soundscape from the mind of steelpan virtuoso Mark Berry (Western Kentucky University). The title refers to a large basin on the northern hemisphere of the moon (one of the nineteen major lunar maria) where humans first set foot. This innovative work loosely depicts a journey to this place, either physically or through one’s imagination. Written for the advanced player in recital, the piece explores rhythmic and harmonic counterpoint with the player’s own echo which is achieved using two basic electronically produced effects—digital delay and pitch shifting. Any effects unit, synthesizer workstation, or even guitar pedal effects could be used to perform the piece. 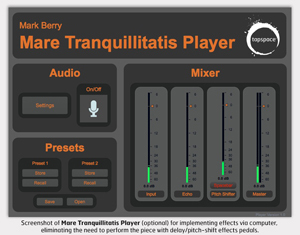 Alternately, we've developed an optional Mare Tranquilitatis Player software that can be run via Mac or Windows computers (using the free demo version of Max), which would bypass the need to use effects pedals. Over ten minutes long, this work is performed completely in real time—there are no sequences or prerecorded sections. Control of tempo and rhythmic accuracy through mixed-meter passages is essential. The performer must be able to play rhythmically and expressively, while controlling steelpan tone quality. Mare Tranquillitatis would be an ideal choice for university percussion students and steelpan aficionados searching for new age treatment of this instrument with a technological flavor.